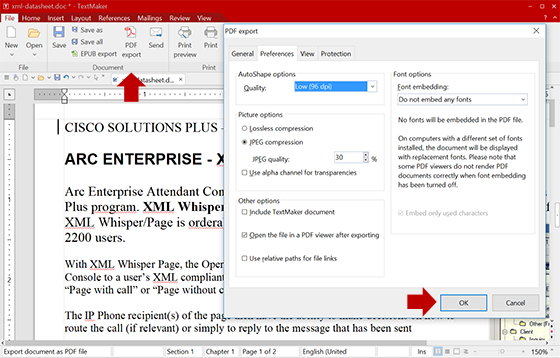 TextMaker from SoftMaker Office 2018 can convert large Microsoft Word .RTF, .DOC and .DOCX files into smaller file size in Adobe PDF format. The native PDF export function allows you to take large documents, export them to PDF, and save on storage space. Read below to see how simple this feature is. Depending on how the document was created, and how the graphics were stored, a file size reduction of 80% can be achieved. Click File – Open, select the existing .RTF, .DOC, or .DOCX file and click Open. Now click the PDF export button on the toolbar. To make the smallest file size, make sure you set up Quality for Low, use JPEG quality for Image Options and do not embed any fonts. Using the following example document file size reduction was 81% using 30% jpeg compression. Your results may vary depending on the document content and preferences options. You can download trial of SoftMaker Office 2018 here.